I was so excited to see this movie! I remember seeing the trailer for the first time in the theater and thinking it looked great! I am super anti-racism and also anti-rich snobby people who think they are better than everyone, so this flick sounded right up my alley. So, I couldn't really find one to watch it at the theater with me... apparently I don't know anyone that thinks that kind of movie is a must see. Hallelujah, I saw it on Blu-ray when it came out!! Emma Stone plays an aspiring journalist who decides to write a book from the perspective of the help, the black women who do pretty much everything in the households of these uppity white people. Some of these women raise the children from birth, yet get cast aside like they are nothing. It was not a new idea by any means to put the plights of the pre- civil rights movement atrocities in the public eye, but the way this was done was quite clever, touching and humorous at times. Fortunately there were a couple of the employers who weren't complete scumbags. The characters were all very well developed, casting was great and it held my interest the entire way through! Family Time Factor: There are several adult themes and some language, so I would say 13 and up. 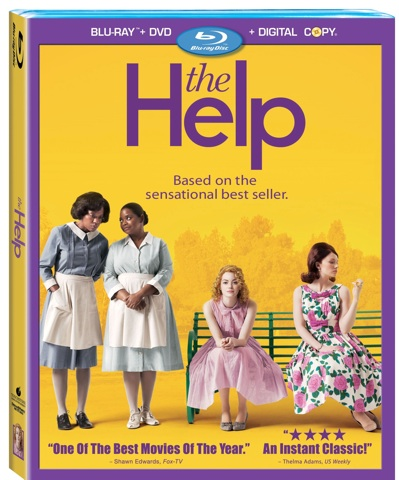 The Help is currently available on DVD and Blu-ray!! !